I just came across a short documentary–K’nawa, une odyssée caribéenne, directed by Guadeloupean filmmaker Daniel Nlandu Nganga. The film was screened earlier this year at the The Montreal International Black Film Festival (MIBFF). It was also shown on French TV in 2013. 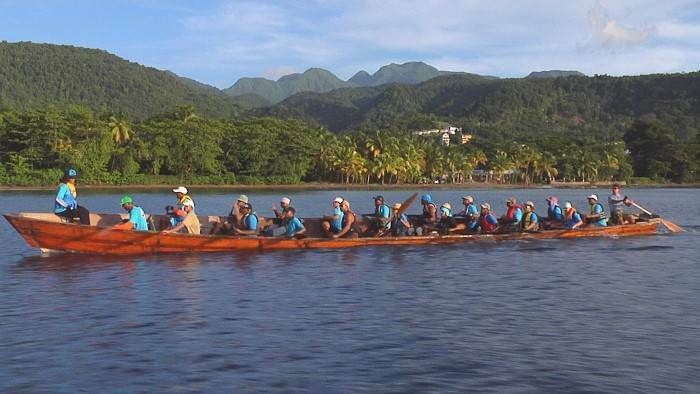 The film documents musician Fabrice Fanfant’s trip on the Kalinago canoe K’nawa to learn more about the historical trajectory of the Kalinago. The construction of the K’nawa began in September 2012, when a gommier tree [also known as chibou in Carib and tabonuco, from the Taíno word tabanuko] was knocked down from the heights of Concord, for the construction of a pirogue. The canoe was built in the Kalinago Territory by members of the island’s indigenous people using age-old methods. The traditional dugout canoe was inaugurated in a joint effort of the Association of Guadeloupe in collaboration with the Carib Council and Discover Dominica Authority. Film Description: Musician Fabrice Fanfant spent twelve days in an immersion adventure on the Amerindian [Kalinago] canoe K’nawa, traveling from Dominica to Antigua via the archipelago of Guadeloupe. It was a unique opportunity for the Guadeloupean bassist to meet learn about the history of Caribbean Native Americans who once inhabited [and still inhabit] the islands of the Lesser Antilles.